Apple Cider Vinegar has many health benefits, from being used as an energizing tonic to a healing elixir. It’s a completely natural product, with all the benefits of apples PLUS the added benefits from being fermented, which include acids and enzymes. adding to chicken bones and veggies, to help draw out the minerals when making broth, using 3 Tablespoons for an 8 quart crockpot size. The list goes on and on. Buying apple cider vinegar, or ACV is fairly easy and widespread. You can purchase apple cider vinegar at nearly any local grocery store. But, did you now you can make your own apple cider vinegar? Yep! It’s so easy, you’ll wonder why you never did before! 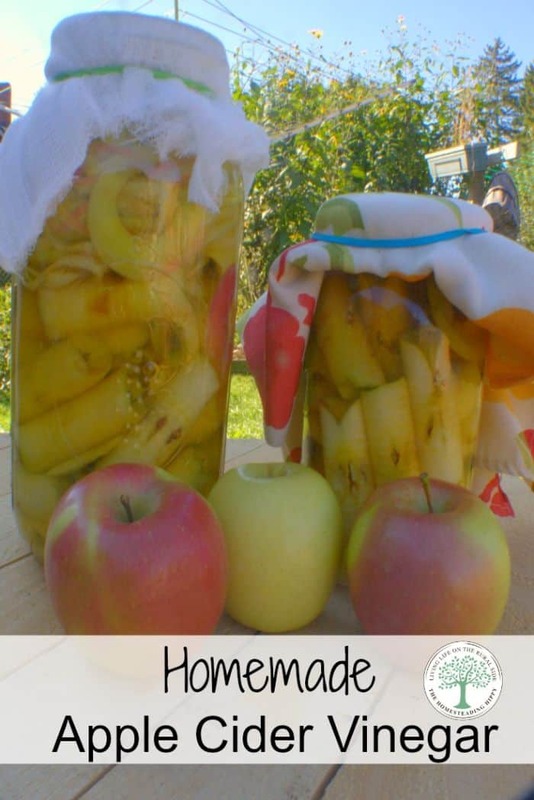 Simply place the peels and cores of the apples that you have leftover from canning, applesauce, or pie making into a gallon sized jar. Fill jar with water to about 2 inches from the top of the jar. Cover with several layers of cheescloth to help keep out bugs, but allow fermenting gasses to escape. After 6 weeks, drain off the liquid. This will be hard cider at this point. Compost the apple peels/cores. Store in a tightly capped jar for another 2-4 weeks to finish the fermenting process. Do you make your own apple cider vinegar? How do you use it? Hi Heather, I love your Blog – its filled with so many informative and healthy life-style tips. I’m a senior citizen living on a grape farm in Western NY so am new to the “organic” buzz but find many of the old fashioned things I’ve done for years around the farm and home were actually “organic” but I’m always try to learn more. Presently have given up my household cleansers for vinegar & baking soda and have a batch of Fresh Eggs Daily’s citrus vinegar cleaner brewing. We have an apple tree that is loaded this year. I’ve given lots away to friends & family and they are of a variety that doesn’t store well so I have been giving them to my hens, ducks & geese (who naturally love them). We have enough applesauce made and recently I’ve had to stop baking as my husband is diabetic and his blood sugars need to be lower – so no sweets like apple pie etc. for awhile. With so many apples available, I presume I can make the vinegar by just chopping up the whole apples and following the recipe for ACV? Its a shame to just feed them all to the poultry if I could make something useful from them. What do you think? I’ve made my first batch of apple cider vinegar the same way you did, but my question to you is, Can I make more from just the first jar? What do I fill the jar up with. or do I start the process again when I finish the cider? Thanks, Your post of fantastic! I love your posts! Just found ya today, from another homesteader on Facebook, The Hippy Gardener. 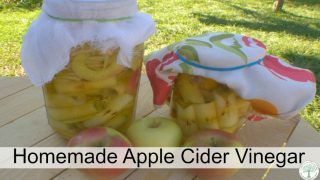 I wondered, is the ACV that you make from this recipe like Bragg’s Apple Cider Vinegar with “the mother” in it? I’ve seen some good recipes that call for Bragg’s particularly. Thanks so much! I really liked your recipe for the ACV. When you made yours did a mother develop? Were you able to reuse it for other batches or do you have to start every batch fresh? I didn’t have a mother develop…so I started fresh with apple cores, sugar and water for each batch. Hi, Heather! Looking forward to trying this recipe. I am recently retired and looking for ways to making my life more rural! After making the ACV, what is the best way to store it? Thank you! Would it be safe to use this for canning recipes calling for Apple cider vinegar? I’m swimming in apples… 😉 Love your blog, btw! In response to your question if this apple cider vinegar would be safe to use for canning recipes, the answer is NO. When you are canning, you use a small quantity which is determined by a standardized strength. Regular white vinegar is 5% strength, whilst the double-strength is 10%. My apple cider vinegar (Filsinger brand) is also “5% acetic acid by volume”. Recipes take into account this standardized strength before determining the quantity within the recipe. Vinegar is not only added for flavour in canning, but its primary purpose is to make the canning process safer and kill all pathogens. Tomatoes, for instance, are not naturally sufficiently acidic to can in a boiling water bath, hence the inclusion of vinegar. Homemade vinegar preparations come in various dilutions and hence cannot be safely used. Same goes with canning recipes calling for bottled lemon juice for preservation purposes. One should not substitute freshly squeezed lemon in this instance since the acidity varies per lemon. Having said this, there are many, many other uses for this vinegar and I can’t wait to try my hand at his recipe. Thanks for the simple directions Heather. A question that I have for you is do you store the undiluted vinegar in the fridge once its made. The natural health food stores brands require it, and I’m wondering what’s been your experience, Thanks…I’ve enjoyed other pages of your site as well. that is great to know! thanks so much for your help, tina! Hi, Heather. I am trying to make my own apple cider vinegar and am not sure I have it right. The liquid has been drained off and is sitting in a little used cabinet in the dark. I just looked at it and there are two crepe looking things floating on the top. Are they the mothers? Also, it doesn’t smell very good, not vinegary although, I haven’t tasted it yet. Am I doing this right or do I need to dump this? Your infor would be greatly appreciated because I’m desperate for some apple cider vinegar. without seeing it, I would have to only that those are the mothers. And, without smelling it, it would be hard to say, guessing again that it might need to sit a while longer? I would let it sit for another week or so, without a tight lid and try it again. Of course, when in doubt, you could always use it for cleaning vs. consuming. once I have done this and have a mamma can I use that to make more vinegar? Hi, could i also use the pulp from making cider for making vinegar? I would try…it certainly couldn’t hurt! Just a question about second process where after draining off the liquid you say to then let it finish for another 4 to 6 weeks in Tightly capped bottles to finish fermenting. Wouldn’t that be asking for trouble because they could possibly explode from the pressure. I make my own kombucha and just started making acv. I just want to make sure I not end up with a huge mess in make cupboards. Thanks in advance. I haven’t had one explode on me yet. But, if you are concerned, then leave the lid looser 😉 Let me know how it works for you! Can I use a plastic gallon pitcher for making this recipe? yes, but it’s better if you use glass. I’m very interested in making this. Some questions first. I’ve seen another recipe on a different website to make ACV, which uses 1 Tbsp of sugar to 2 cups of apples and 3 cups filtered water. Your recipe calls for considerably more sugar. My question is this: how does the quantity of sugar affect the quality of ACV or the speed of making it, or any other variance, and what can i expect by changing it? I’m assuming there’s more than just a taste difference involved. Also, if my ACV didn’t form an obvious mother, would utilizing a small quantity of the prepared vinegar help to kick start the next batch. Thanks kindly.